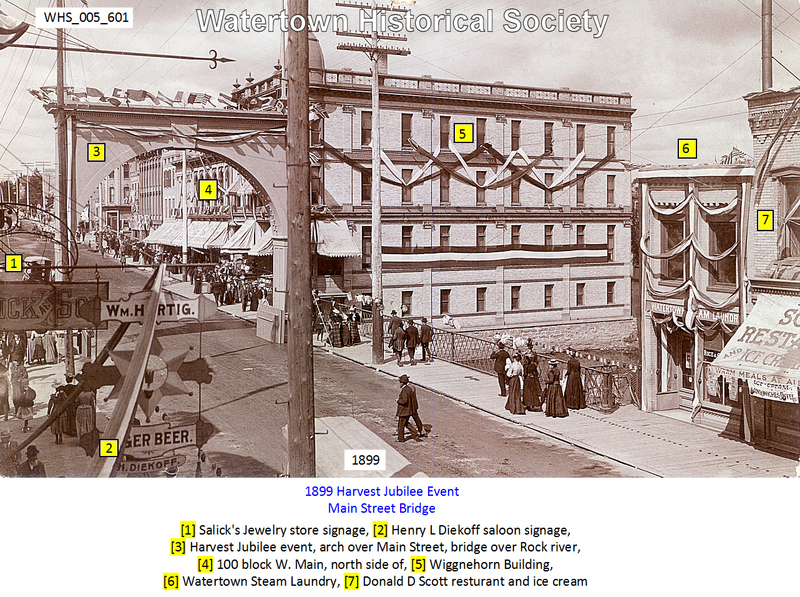 1892-93 and 1893 Watertown City Directories list Theodore and William O’Hara, O’Hara Bros., as propr’s, and both res 2 Main St.
Rice & Campbell, the enterprising proprietors of the Watertown Steam Laundry, have leased the building on First Street (*) now occupied by William Ames pump shop and will remove their plant as soon as the new quarters can be made ready. The building will be remodeled, an addition erected that will materially increase the accommodations, and every necessary convenience provided. The proprietors also intend purchasing a lot of new machinery, and taken altogether, the contemplated improvements will provide one of the most complete and up-to-date laundry plants in the state. An uptown office will be maintained in the present location, No. 2 Main Street, for the accommodation of patrons. Since locating here, Messrs. Rice & Campbell have made a success of their undertaking, and their friends are pleased to know that their prosperity is so substantial that they find it necessary to branch out and secure larger quarters. They are progressive and popular young business men and well deserve to succeed. 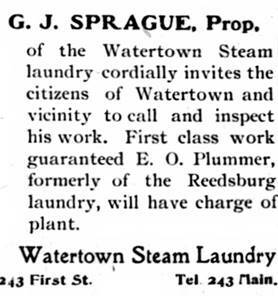 Messrs. Rice & Campbell, the enterprising proprietors of the Watertown Steam Laundry, can now boast of having as neat and complete an establishment of the sort as is operated in the interior of the state. 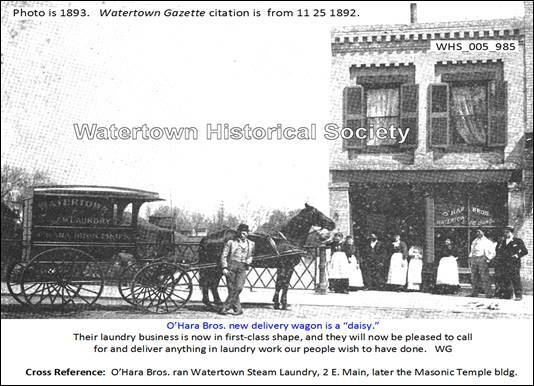 They have during the past week become nicely settled in their new quarters —-the old Ames building on First Street — and an inspection of their plant is sufficient evidence of their claim to conducting a laundry on the most approved and up-to-date lines. The establishment is divided into four parts — the office, the ironing, finishing and sorting room, the washing and drying rooms, and the boiler and fuel room. A twenty-five-horsepower boiler provides steam for the engine, for the drying room and for the heating apparatus, while an eight horse-power engine furnishes motive power for the machinery. Included in the machinery operated are two large washing machines and an extractor, or wringer, all built after the latest models. After the linen has gone through these contrivances, it is placed on racks in the drying room, where the intense heat does the necessary work in less than an hour. Then the starchers are brought into service, whereupon the linen is ready for the ironing room. Gas, combined with compressed air, is used for heating the irons, rollers, etc. These machines are perfect in construction and render a high finish to the work, at the same time greatly simplifying the old manner of handling laundry. The plant is also provided with minor machines necessary to skillful workmanship and is in every way prepared for the turning out of large quantities of laundry in a short space of time. Messrs. Rice & Campbell are indeed nicely situated and their continued success seems assured. Their enterprise is a credit to the city.